“African folktales always invite us to talk about how characters behave,” writes acclaimed author Beverley Naidoo in the foreword to her latest title, a patchy collection of stories hailing from nine African cultures. While these tales display wit and pithiness, some will leave readers nonplussed rather than eager to discuss them. The one-page title story, an Amharic tale from Ethiopia, evokes the rivalry between Lion and Elephant, which is resolved simply by Elephant grasping Lion and pitching him in the sky and then trumpeting as he lumbers away. The tale seems so insubstantial, one can only wonder at the prominence awarded it. Others, notably the pourquoi tales, deliver crisp narratives worthy of reading aloud and discussing. “Why Hippo Has No Hair,” a Luo tale from Kenya, reveals a rousing narrative describing the doomed friendship of Hippo and Fire. Fire is so excited about his first visit to Hippo’s home, he begins to rush and devour everything in his way. When he arrives, Hippo asks him in and suggests he sit on his bed. Alas, the bed of dry grass burns, and then flames lick the whole house. As he squeezes past his friend, a hot and frightened Hippo feels his hair catch fire. Happily, Hippo finds relief as he throws himself into the nearby river. After that, Water becomes Hippo’s best friend—and we readers discover why hippos have no hair. While it’s necessary to include some darkness in the tales (the burned house, for instance), a couple of instances of misogyny provide nasty surprises. In the Igbo tale “Tortoise and his Banjo,” Leopard gets angry after waiting a long time for his wives to bring refreshments to the villagers helping at his farm. “In a rage, he stripped a whipping branch from a tree. He would teach them a lesson they wouldn’t forget.” Adults who are reading this aloud might, unlike Ms. Naidoo, choose to omit such a cruel intention without any substantial loss to the story of how Tortoise teaches Leopard a lesson in hospitality. Naidoo, who teamed up with fellow South African Piet Grobler for Aesop’s Fables (2010) is again fortunate in such collaboration, as Mr. Grobler’s sprightly, vibrant illustrations, wrought with ink, pencil, and watercolors, enhance the stories’ lively pace and humor. 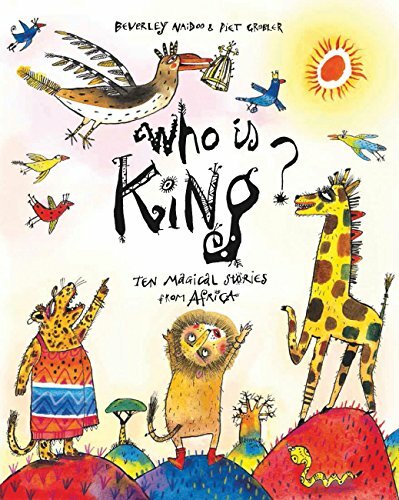 Readers looking for fresh retellings of African tales will find Who Is King? an attractive but uneven collection.